“Where are we and what is the temperature going to be like when we get where we’re going? Bring me a bowl of fries and a beer, while you show me the holiday pictures we have taken so far. Then, at five o’clock, please deliver a mojito and a strawberry daiquiri to our loungers by the pool. And the same again at six. And, when I arrive at the theatre tonight, please arrange for two glasses of red wine to be delivered to our seats. And one more thing: when I get back from the theatre, make sure I am not locked out of my room”. That might sound like an over-indulgent Bond villain making demands of his entourage, or a boy-band member testing the patience of his new management team. But it could be you, thanks to an innovative device being launched by cruise company Princess Cruises later this year. The “Ocean Medallion” is a wearable device, engraved with the passenger’s name. 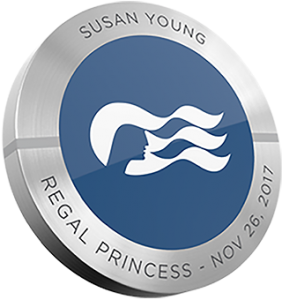 It pairs with the “Ocean Compass” – a personal digital concierge, accessible through thousands of 55-inch, high-resolution screens throughout the ship, via displays in passengers’ staterooms or via guests’ own mobile devices. The key to the system – and where its efficacy will be best demonstrable – is that it will not just deliver what the guest wants, it will anticipate what they will want. For example, when walking back to their stateroom, the door will automatically unlock, the lights will switch on and – when necessary – the air conitioning will resume. Or, if a passenger usually orders a dry white wine when they sit by the pool, the system will prompt them to order next time they arrive poolside. The medallion can be worn as a wrist band or as a pendant (by using attachments available to buy) or simply carried in a pocket. It uses Near Field Communication and Bluetooth technologies. And it is likely to be a major talking point by its early adopters when it’s launched in November 2017. Princess Cruises carries around 2million passengers a year. This innovative technology will reduce the costs to serve passengers but, more importantly, tailor the cruise experience closer than ever to exactly what each passenger demands. And, in doing so, Princess Cruises will surely benefit from further repeat business, greater word of mouth and – who knows – maybe the odd Bond villian looking for some relaxing down time.